The "hidden node" problem affects all simplex (transmit and receive on the same frequency) communications, whether voice, data or otherwise. This page describes the problem and suggests some specific steps that can be taken to reduce the effect. There are three stations ( "A", "B", and "C") operating on a single frequency. Their locations are represented by the colored letters above and their RF coverage areas are represented by their respective colored circles. Stations A and C are field stations with modest antennas which have smaller coverage areas.. The two field stations (A and C) are trying to talk to the same station B. The letters A and C are within the coverage area for station B. But neither field station (A or C) can hear the other field station.. The location of station C is outside the coverage area of station A, and vice versa. This situation is referred to as the "hidden node" problem. Station A's transmitter is "hidden" from station C, and vice-versa. In the case of a data net, the packet TNCs or data radios at stations A and C will listen for packets or carrier (depending on how they are configured) prior to transmitting. But, since stations A and C can't hear each other, each will likely attempt to transmit while the other is transmitting. Because station B has broader coverage (typically because it is located higher), it hears both transmissions from stations A and C at the same time (commonly referred to in FM as a "double"). The result is garbled communications.. In a voice net, the net control will usually announce that there was a double and ask for station A or C or both to try again. 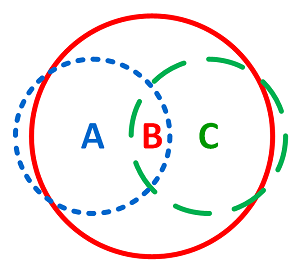 In a data network, neither station A nor station C receives an acknowledgment from station B, so they both have to try again. The protocol used by the TNC or data radio has random backoff and retry mechanisms that will help both messages to eventually be delivered. In both the voice and data case, the total throughput of the channel has been degraded. A good description can be found here: https://en.wikipedia.org/wiki/hidden_node_problem. The article uses a WiFi access point as an example. But the principle is the same for any simplex operation. The designers of stations A and C could help eliminate (or at least greatly reduce the likelihood of) the hidden node problem by building a station that has better RF coverage using the techniques below. Improve the antenna system. This impacts both the ability to be hear and be heard by others. The most effective way to improve RF coverage is to raise the antenna. Theoretically, either station A or station C could raise its antenna higher so that its coverage area includes the location of the other field station. Then both field stations will be able to hear each and be heard when they are transmitting. In reality, there are probably more than just the two field stations A and C. So it is best if all stations raise their antennas so that all other stations in communication with Station B will be able to hear and be heard by all other stations..
All other things being equal, a higher gain antenna will usually transmit the signal further and allow for better reception of stations that are farther away. As an example, switching from a unity gain J-pole to a 6-9 dB gain collinear ground plain antenna can broaden the coverage area. Lower loss coax improves both the transmit and receive situation. More signal is delivered from the transmitter to the antenna, and more received signal is delivered from the antenna to the receiver. Coax loss increases with the length of the cable and the frequency. Higher frequencies and longer runs will benefit the most from better coax. For the lowest loss, use hardline. Increasing transmit power has less effect than improving the antenna, but it can help. Increasing transmit power at station A would potentially allow station A's transmissions to be heard by station C. So, station C could avoid transmitting when station A is transmitting. But without an improvement to the antenna, there is no improvement in what station A can hear. So, Station A may still transmit while Station C is transmitting. So both stations, A and C need to increase transmit power to that their signal is heard over as much of the coverage area of station B as possible. The FCC rules require that we use the minimum transmit power necessary. In the case of simplex, this means using enough power so that all other users on the net can hear your station. For packet, 25-50 Watts (plus an excellent antenna) is needed to cover the several cities that use a given BBS. Also, users should only use their primary or secondary BBS unless both are unavailable. Remember, it's not about being heard by the BBS. It's about being heard by all other users of the BBS. The best solution is to use all of the above techniques. It's also more realistic since there are practical limits to each of the above options. Using all available options maximizes the chance of hearing and being heard by all other stations. With data radios, another solution is to use a protocol that helps to avoid collisions. Two examples are described below. With RTS/CTS, when station A wants to transmit a data packet to station B, it first sends an RTS packet to Station B. Station B sends an CTS packet back to station A. Even if Station C can't hear the RTS from Station A, it can hear the CTS packet from Station B. So it will hold off transmitting until it hears the all clear from Station B. This obviously slows down the channel for everyone due to more round trip communications. Experiments show that it usually does more harm than good when there are many stations on the radio channel. But it can help when there are few stations and severe hidden node problems. If the data rate is high (such as with WiFi), then time division multiplexing can be used to divide the bandwidth into time slots and assign those time slots to each remote station (A and C). This method is commonly used in point-to-multi-point fixed wireless applications, such as commercial WiFi service providers. The access point (Station B) controls when each subscriber station (A and C) can communicate, thereby avoiding collisions.